Here is Dan Smith's Lake James video that we shot last week at church camp. I am featured in the video as the campfire speaker at 2:43 . . . You can see Caleb at 1:53 . . . Very cool . . .
Caleb cracked open his lawn mowing piggy bank tonight and paid for movie tickets for the three Weller men. He and Jonah cashed in our pop bottles, too, providing for candy and popcorn. Our choice of screenings: the new Batman flick. I'll admit that I was skeptical about it. The whole world has been going to see the film. As one who, from time to time, swims against the tide, I assumed I wouldn't like it. Wrong. It was an engaging and tense drama that kept us glued to our seats from beginning to end. Heath Ledger was great. His effort eclipsed the rest of the cast. I can't actually tell you who played the Caped Crusader, in fact. The boys said that the movie was better than Ironman, and better than Hancock (which they liked quite a lot). I'll have to take their word for it. The best part of the movie for me: escaping for a bit into the land of make believe. Shame the lights had to come back on at the end of the night . . .
Why I go to camp . 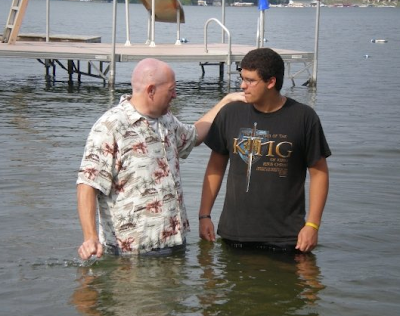 . .
One week ago tonight I was privileged to baptize Rodger at Lake James Christian Assembly. He is a fine young man who will, I believe, make a difference for the Kingdom. 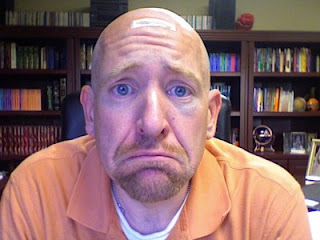 I've heard about elders that give their preachers black eyes, but I always assumed it was metaphorical. Before today, that is. As you can see from the photo, I am recovering from my surgery quite well. Before South Lansing Christian Church elder, Dana Allen, (not that I am naming names or anything) gave my this shiner with with his pointy elbow. Dana has what is, arguably, the ugliest jump shot I have seen. Ever. He makes sure he is just behind the three-point line and then throws his six foot six inch frame forward, thrusting his right arm (or is it left) out and upward toward the basket. The other arm not so much guides the ball, but provides the necessary ballast to ensure he doesn't topple over. The thing is, more often than not his ugly shots go in. I D'ed up on Dana this afternoon at lunchtime. He threw up another nasty looking three and I dove in underneath his shot to try and throw him off a bit. As he came down his pencil sharpened elbow caught me on my orbital socket. Pain. Swelling. No big deal - or so I thought. After showering I walked up to the office and Sue said, "What's with the shiner?" Sure enough I have a black eye that is reminiscent of the old cigarette ads. You know the ones - "I would rather fight than switch!" Way to go Dana! On the other hand, it has given me the opportunity to point out to anyone who asks that the stitches in the forehead and the bruised eye were given to me by my wife for coming home too late. She loves that. Come to think of it, I better lay off the husband beating humor before she provides some fist-induced symmetry to my already battered melon. Under the knife. . . Frankly Speaking took to the road Monday morning traveling to Ingham Regional Medical Center for the excision of a lipoma from the mid forehead. I was awake for most of the surgery. The nurse anesthetist, Jane, gave me a little sleepy-sleep to keep my mind off of the numbing medication that they were injecting into the surgical site. When I woke up a few minutes later, Dr. Supanwanid had already made his incision and was excising the tumor. He used a bovie - an electrical scalpel of sorts - that cuts and cauterizes at the same time. I could see smoke curling up from my eyes as he cauterized the little bleeders that saturate the forehead. Assisted by scrub nurse Natalie, and surgical tech Jennifer, he and Jane made quick work of it. The whole thing took less than thirty-five minutes and, surgically speaking, everything went according to plan. They cut that little dude out and stitched me up good as new. I see the doctor again next Monday. I am anticipating that I will be getting some pictures from Dr. Supanwanid. He snapped away with his digital camera before, during, and after the procedure. I'll be posting them here for you all to enjoy! Just the best group ever . . . I invested the whole week in these amazing students at Lake James Christian Assembly. Several of them rededicated their lives to Christ. 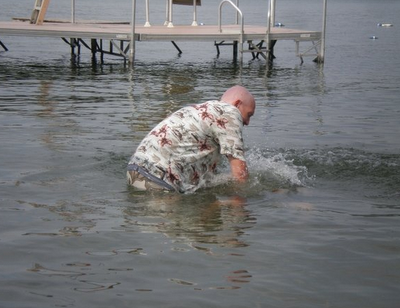 One, Roger, is going to be immersed into Jesus later this afternoon. I had a good conversation with one of them about giving her life to full-time Christian service, too. It was a week well spent . . . 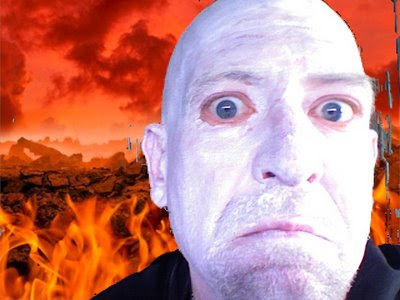 Walked through hell tonight at Lake James Christian Assembly. I was a demon. Here I am. I sure am glad to get my normal lovely face back. Missing you all at South. See you next week. In the meantime, Dean Trune will be preaching on Sunday. His sermon, Change Changes Me, will teach about how change affects our character. As I stood waiting to give my campfire talk last night it occurred to me. 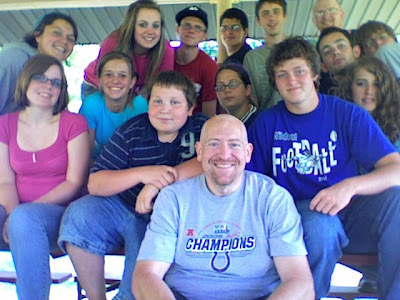 I am the oldest guy on faculty at LJCA Senior High camp this week. I am that guy. You know . . . the guy that all us young buck youth ministers used to look at and think, "I'm never going to be like that old guy." I am now him. On the one hand, I am greatly encouraged to know that there are so many great younger people who are committed to ministering to our students. On the other hand I wonder if there aren't some older wiser people from whom our students can better learn. If I am the oldest man on staff here, I wonder if maybe we don't need someone with more gray hair than myself to give students a more complete perspective on life and life with Christ. Then again, maybe I just don't want to be the "old man" of the camp . . . There's a camp that takes the banner . . .
Our first full day of Sr. High week at Lake James Christian Assembly is in the books. What a great day! Our students were challenged today with a time of personal reflection. Who are they? How goes their relationship with the Father? They heard about grace from Dan Smith, and tonight I challenged them to consider how small they are in relationship when compared to the Father's enormity. That is what I hope to drive home this week during my campfire talks. The three little Franklies and I are headed to Lake James Christian Assembly this week. Mrs. Frankly is staying back to go to class. She should enjoy the peace and quiet time to study. As for us, we'll be blessed by the week of camp! Here is something to make you smile while I am away . . . It's 7 PM. Do you know where your preacher is? A BBC story about a pastor that disguised himself as a tramp reminded me of a sermon by Mike Breaux. Seems that, years and years ago, Brother Breaux disguised himself as a homeless person. He wore old army clothing, a nasty wig and a beard. Sunglasses and a couple of paper grocery bags into which he had stuffed his "belongings" completed the ensemble. Oh yeah, there was also the smell. He had deliberately stunk up his clothing to make himself seem as though he had been on the streets for some time. He was scheduled to preach for the Sunday night worship service at his church. (Remember when we used to have Sunday night church?) He arrived about the time the service was to start and made his way into the "sanctuary." Nobody spoke to him. Mother's drew their children close. Hostile stares greeted his walking down the aisle. He chose a seat about half way toward the front. At the conclusion of the song service, the worship leader sat down. The congregation began shifting in their seats wondering where Pastor Mike was. Had he forgotten? Was he somehow detained? Then, the "bum" rose from his seat. He slowly made his way toward the pulpit, shedding the wig and clothing as he went. Brother Mike related that, by the time he stepped to the pulpit, he was sick to his stomach by the insensitive way he was ignored. So, as he tells it, was his congregation at the realization of what had just taken place. I wonder how South would react in similar circumstances. Would we embrace the un-embraceable? Would we welcome the unwelcomed? Would we draw in "the least of these" or would we suggest a church down the street where they might be "more comfortable?" I hope (and I believe we would) be Jesus to whomever comes to our door. Its half past midnight and I'm hanging out in the Sparrow Pediatric Emergency Room. Abigail busted her melon tonight at youth group during a game of steal the bacon. She felt kind of woozy at first but then quickly recovered. Later, at the movies, she began to feel nauseated and had a huge headache. On the advice of a doctor friend we stopped by Sparrow to have her checked out. The folks here tell us she has a "grade 2 concussion." Short term memory blips, trouble concentrating, headache, the pukes. Frankly, it sounds a little like finals week at Grand Ledge. So we're hanging out waiting for CAT scan results. As soon as they come back we're headed home. Till then, Abby sleeps and I blog and wait. Plans are shaping up for our medical mission trip to Haiti on March 13-21, 2009. Our OB/GYN team will perform surgeries all week long while others in the team work with Haitians ranging in age from infants to the elderly. My wife, Tracy, is leading a team from our church and is looking for medical professionals as well as anyone with a heart to serve Jesus. That means that, while doctors, nurses and other caregivers will be coming along, so can students, teachers, farmers, factory workers and anyone else who is willing to be used by God. There will be plenty for everyone to do: construction-related projects, helping with the nutrition program, cleaning, rocking babies, and just blessing the Haitian folks. If you're interested in joining our team, or if you would like more information, click here to email Tracy. Enjoying the day at Jordan Lake with Fred and Mariah and family. Went tubing and drank about thirty gallons of lake water. Tons of fun! Hope your 4th is great, too and, if you see a veteran, remember to thank them for keeping our freedom. The spice in my sermons . . .
Two nights ago my son, Jonah, and I watched the Disney animated flick Ratatouille. Fun movie! I love the part where the little rodent runs around the kitchen tossing in a bit spice here, a clove of garlic there. He cooks up a sopa de dia to die for. My sermon preparation often resembles that. I teach aspiring preachers a method of sermon preparation that I call the "Eureka Method." I pile all the language tools and commentaries on my desk. I open my Word Search program to several different translations. I've got dictionaries and encyclopedias piled around my desk. And then I dive into it all. After a while, an outline begins to emerge from the haze. Then, at some point, (I never know when that will be. Sometimes it happens quickly; other times it is painfully slow) I have this "aha" moment where I sit up and say "that's what it is!" That is my Eureka moment. From that point on, the sermon writing takes on a life of its own. Often times the cherry on top of that ice cream sundae is a video clip from SermonSpice.com. A few weeks back, for instance, I was preaching on the relationship between husbands and wives. I showed a clip to make the point that women need leadership and comfort from their husbands. It had a powerful impact. More recently, I used a clip titled "Alone in a Crowd" to demonstrate that, in spite of us having many acquaintances, too few of us have really deep friendships. While considerably more expensive than, say, BluefishTV.com, SermonSpice has nevertheless become an important "club" in my homiletics golf bag.